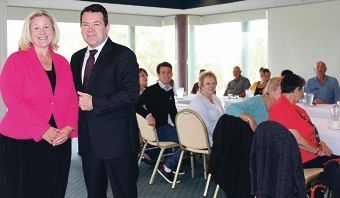 Liberal candidate for Brand Donna Gordin and Senator Dean Smith met with grandparents in the Peel region recently. Mr Smith met with grandcarers in the Peel region at a community forum at Meadow Springs Golf and Country Club on August 5. Hosted by Liberal candidate for Brand Donna Gordin, grandcarers called for more understanding from the community and Government. ‘Some of the stories that these grandparents share are inspiring and heart-rending in equal measure,’ Ms Gordin said. ‘There are a variety of reasons why children may find themselves being cared for by grandparents, but it’s very often because their parents have been unable or unwilling to take responsibility for them. She said many of these grandparents were living on lower and fixed incomes, yet were still required to meet the expenses that come with raising younger and teenage children. ‘The increased cost of living that many local residents have experienced over recent years has hit particularly hard this group in our local community,’ she said. Mr Smith said he would champion the issue to get a better deal for grandparents rearing children. Brand MHR Gary Gray said the Federal Government provided a number of benefits grandparents could access. Grandparents on an income support payment may be eligible for Grandparent Child Care Benefit, which covers the full cost of child care for their grandchild. Grandparent and kinship carers can also obtain a non-income tested Foster Child Health Care Card.